Momentum continues to build on Buffalo’s Outer Harbor as additional announcements continue to roll in after Governor Cuomo’s announcement confirming the NFTA’s withdrawl from the massive property this year. The newest group to step forward is one pushing for a large park to be constructed on the Outer Harbor. Their plan calls for a massive 130 acre area to be occupied by a brand new park that would span between Wilkeson Pointe and the recently purchased Terminals A and B. The Buffalo News has all these details if you wish to learn more. What interests me is the scope and approach of this proposal. While I’m not usually one to promote yet another open park in place of potential mixed use development along out waterfront, this strikes me as one of the strongest uses of waterfront land since the renewed interest in developing the waterfront began. Of course, in typical Buffalo fashion, this is currently little more than a pretty drawing being promoted by a community interest group set to be presented along with other pretty drawings from other groups. Regardless, it serves as a strong use for a significantly large piece of land that’s sat vacant for far too long. You may notice that this land is part of the proposed Bills stadium that was pitched earlier in the year. I’m not particularly fond of that stadium plan although I assume that group may be amongst those pitching ideas along with the 21st Century Park group – exactly how many wasn’t mentioned by the News. Kudos to the 21st Century group for noting the Esmonde Template in securing noted preservation obstructionists as “close friends” as stated on the park website. This is the type of project that those two loveable “waterfront development enthusiasts” would promote, but it just goes to show the importance of securing the proper protection for your projects. There are a few reasons why this site appeals more as a large park than anything else. One is the overwhelming size of the land. Outside of Liberty Hound (pre-built structure) and One Canalside (retrofit building), there hasn’t been any private building on Canalside’s parcels. 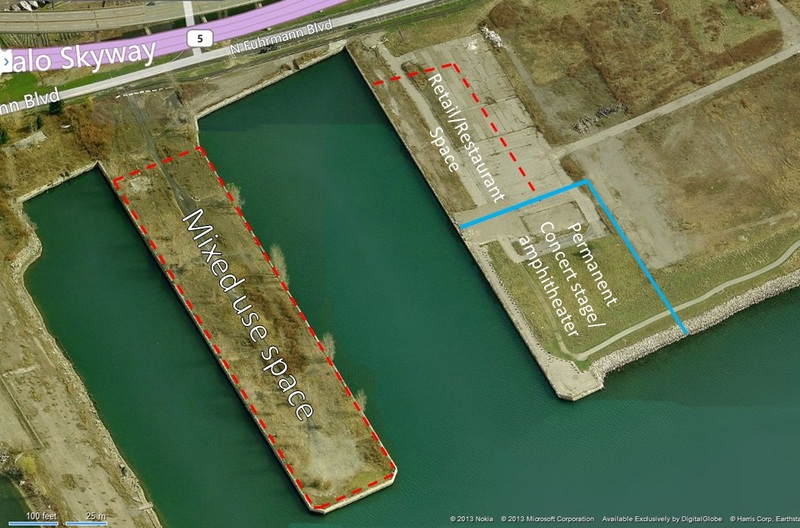 If there’s been this much trouble in attracting tenants to space in Canalside, how difficult will it be to fill space on the Outer Harbor? Not to link this area and Canalside, as the two different in many ways, but if there’s already one specific portion of the waterfront that’s envisioned as a mixed-use neighborhood; why throw another into the mix? Plus, with the 21st Century Park hitting on all the subjects of public access, green space etc. 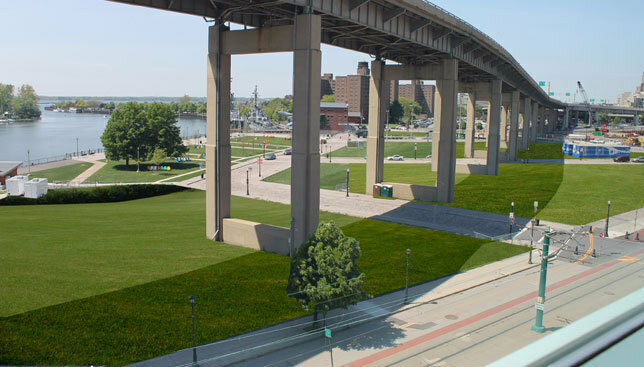 perhaps everyone will relax a bit and let development flow a bit more freely at Canalside. 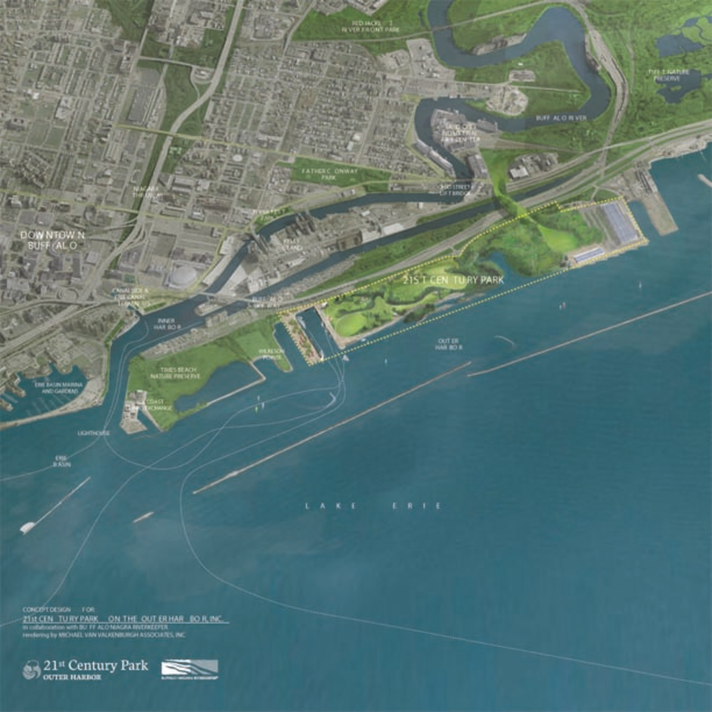 The second appealing prospect of this property is that it would serve to connect already existing parkland from the very end of the Outer Harbor straight down to the Small Boat Harbor and Gallagher Beach. The only space that would interrupt the connection is the privately owned Freezer Queen building (which was once envisioned as a pretty badass hotel). While I do think it’s important to leave the commercial development to the parcels at Canalside, I do think there should be a mixed use element implemented into this site. While the rendering doesn’t indicate exactly what the scope of the mixed use portion of the 21st Century plan is, a well-thought plan would serve this area well. Based on the size and general design – based on the rendering – this park has a similar feel to that of Millennium Park in Chicago. It’s expansive, would have space for a concert venue much like what is seen in the Windy City’s signature space. The promenade portion that’s mentioned by the planners has the potential to have a boardwalk look and feel to it if done properly – so long as there aren’t any solar-powered carousels. They’ve penciled that into the peninsula nearest Wilkeson Pointe (I’ve marked it on the blown up picture) and this space could serve as an anchor for those coming to the park on a daily basis. There doesn’t need to be anything too crazy out there outside of a few restaurants – no need to draw from potential future development on the inner harbor – capable of serving quick meals or even sit down dinners to patrons. What’s more important, to me, is constructing an actual concert venue in this area. The area I’ve marked on the blown up picture is the former site of The Pier and now serves as the home of the temporary stage for the Outer Harbor Concerts. There doesn’t seem to be too many ideal spots on the inner harbor for a venue and it’s high time that the city got a permanent venue for summer shows. Using places like Nautica Pavilion (Cleveland) or Charter One Pavilion (Chicago) as templates – hell, just use Northerly Island as the template for this whole area – would provide Buffalo with an idea venue for summer shows. It’s about time the city had a place with a permanent stage, support facilities and concessions to not only draw larger summer tours but to possibly offer better footing for Buffalo Place should they need to attach a fee to their Thursday at the Square shows. There is likely to be a number of ideas floated for this land in the very near future. Perhaps some will have more of a focus on big-box thinking than others. But at this point I think the 21st Century Park feels like the way to go.